For 50 years, Missouri’s 15th Congressional District consisted of Barry, Barton, Jasper, Lawrence, Newton, McDonald and Vernon counties. From 1883 until 1933, prominent lawyers, judges and county officials vied for that congressional seat. Joplin was home for three of the congressmen: Charles H. Morgan, Perl D. Decker and Joe J. Manlove. Each man had a long career of public service, but Decker stands out as a principled maverick frequently at odds with popular opinion of the day. Perl Ditmer Decker was born on a farm near Coolville, in Athens County, Ohio, on Sept. 10, 1875. His family moved to Hollis, in Cloud County, Kansas, in 1879. He attended public school there and Park College in Parkville, Missouri. 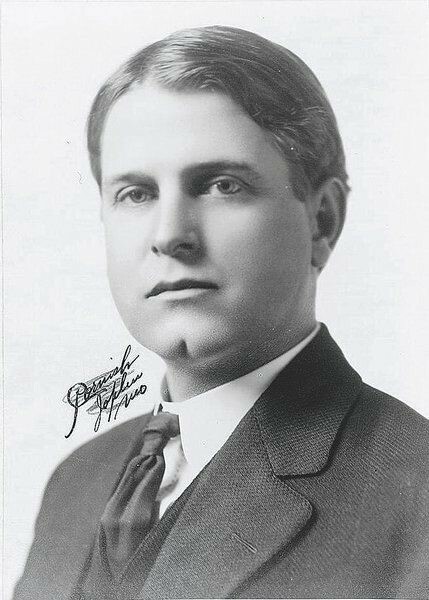 He graduated in 1897 and entered the University of Kansas, earning a law degree in 1899 and getting admitted to the bar in 1900. As a student, Decker made his mark in oratory contests. He won an interstate contest with a speech, “The Basic Law of Progress.” He was involved in the issues of the day and was a staunch supporter of Democrat William Jennings Bryan. So when he moved to Joplin in 1900, he was a natural for the post of city attorney. At that time, Joplin’s city government was based on partisan politics. The hotly contended elections for mayor and councilmen were continual battles between Democrats and Republicans. Joplin had a strong Democratic Party organization headed by Globe editor Gilbert Barbee, while Jasper County outside of Joplin leaned toward the Republicans. Decker served as city attorney for two years, from 1900 to 1902. He had just left office when his eloquence and courage were tested to the limit. On April 14, 1903, police officer Theodore Leslie was searching for suspects in the theft of two pistols from a hardware store. He was killed in a struggle with four men, three black and one white, in the Kansas City Southern rail yard. Thomas Gilyard, a black transient from Mississippi, was captured a day later. While he admitted being in the railcar with the other men, he protested his innocence. Rumors had swept the city, and by the evening, a crowd estimated at 2,000 gathered around the city jail calling for his lynching. The calm was short-lived. Other men came forward to stir up the crowd again. The passionate crowd charged the jail, battered down the door and Gilyard’s cell door and dragged him into the street. Even as the mob tried to lynch Gilyard, Decker had not given up his attempt to rescue the man. Decker rode through the churning mob on horseback, “pushing aside those who stood in his way.” His and Mayor Thomas Cunningham’s calls to take the prisoner back to the jail once more gave the mob momentary pause. But it proved fruitless, as the would-be rescuers were fought off by the crowd. In Congress, he called for the U.S. to stay out of the European war. In a 1916 speech on the McLemore resolution, he declared: “I am willing to go to war for an American right, but it must be a vital right. … Why am I a traitor and a coward when I stand in the halls where Henry Clay stood and say, ‘You shall not hurl the miners and the farmers of my district into this hell of war; you shall not take the sons from the mothers of my district and sacrifice them at Verdun or in the trenches of Europe in order to maintain a doubtful right.’” He lost the 1918 election because of his anti-war stance. He continued to practice law. Never afraid of an unpopular stance, in the 1920s he was an opponent of the Ku Klux Klan even as he maintained their right to free speech. Although retired, he was often called upon to give speeches on constitutional topics, such as his 1922 speech on “Free Speech and Free Press.” In 1932, he served as a delegate to the Democratic National Convention in support of Franklin D. Roosevelt. He suffered from declining health for several years and died Aug. 22, 1934, at age 58. Eulogized as “an ornament to his country and state” in an oration by Allen McReynolds of Carthage, Decker was buried in Mount Hope Cemetery in Webb City.